A few months down the road from where we find ourselves today one of the biggest records of 1949 will be released. In fact it’s one of the most significant records of the entire Nineteen-Forties and it was made by the greatest single artist of the decade, someone who unquestionably was the most important influence on the entire rock ‘n’ roll movement. We won’t be reviewing it. The reason we won’t is fairly simple – it isn’t a rock record nor is the man who recorded it a rock artist. But make no mistake about it though, without Louis Jordan there would be no rock ‘n’ roll to begin with. The most popular black bandleader ever wracked up an astounding 18 #1 hits on the Race Charts during a decade of utter dominance the likes of which hasn’t been seen since. Not by Elvis Presley, The Beatles, or Michael Jackson at their peaks did any one have such an extended run of success as Jordan. Try this stat on for size: Between the last week of October 1942 and the end of November 1950 Jordan spent a whopping 559 weeks on the charts. So you don’t have to do the math yourself that period spans just 515 weeks, so he basically had at least one, if not more, songs on the charts for that entire time. As if that weren’t impressive enough for the majority of that time there were only FIVE SPOTS on the Billboard Race Charts! All told he held down the #1 spot for 113 of those weeks, or more than two full years. But statistics are one thing, the impact and influence of the music is another thing altogether and Jordan doesn’t take a back seat to anybody here either. What he popularized starting in 1938 when he set out on his own after being an alto saxophonist and occasional singer in Chick Webb’s band is what set into motion much of what became the foundation of rock ‘n’ roll. So many of the aspects rock became known for – the shuffle rhythm, witty lyrics speaking directly to the target audience about circumstances they knew firsthand and in a language that was authentic – stemmed from Jordan’s work throughout the 1940’s. Throw in his own sax solos and the guitar work of Carl Hogan, one of Chuck Berry’s primary influences, and it’s pretty easy to see where much of what followed in rock owed its greatest debt to. Jordan was the undisputed Grandfather Of Rock ‘n’ Roll. Yet he wasn’t a rocker himself and so his unrivaled legacy has dimmed considerably in the years since, when it was rock which drew all of the enduring acclaim and most of the historical reverence. By the time rock ‘n’ roll came into being in late 1947 Jordan had absolutely no need to throw in with it. 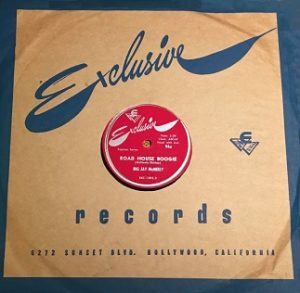 Just a few weeks before Roy Brown launched rock ‘n’ roll with Good Rockin’ Tonight Jordan had released Boogie Woogie Blue Plate, a song that would soon sit atop the charts for fourteen weeks! By the time it left the #1 position rock was still waiting for its first hit of any kind. He notched another #1 hit in the summer of 1948 but by now rock was increasingly making its presence felt and crowding Jordan out of the picture to a degree. He was still churning out consistent Top Ten hits but more and more it was rock records that were making the most noise. It was probably only natural that Jordan’s curiosity was piqued by this new development that drew a lot from his earlier innovations and while he never gave himself over to it wholeheartedly he definitely noticed its appeal and looked to adapt. Two songs he scored with during this time illustrate just how he managed to use rock ‘n’ roll material in a manner that remained true to his own style while hoping to bridge the gap. As usual with Jordan he was pretty damn successful at it. The first was a song written by his old cohort Jesse Stone who’d first served as an arranger for Chick Webb and was a key factor in Jordan’s artistic development in the late 1930’s. Ten years later Stone was working for Atlantic Records and helped to re-craft his own composition Cole Slaw as a rock instrumental for saxophonist Frank Culley. Jordan then covered it using Stone’s lyrics to make it a different type of record for a different audience and had a pretty big hit with it. But it’s the other one that we’re concerned with, a two-part social protest against the common practice (then as well as now) of police targeting black citizens for arrest with no just cause which struck a chord with the same audience that was now making rock the king of the throne in black America. The record is Saturday Night Fish Fry, a massive hit and one of Jordan’s signature tunes, #1 on the charts for twelve weeks and – for whatever it’s worth – would earn a perfect ★ 10 ★ as a record by any standard of assessing popular music of the 20th Century. 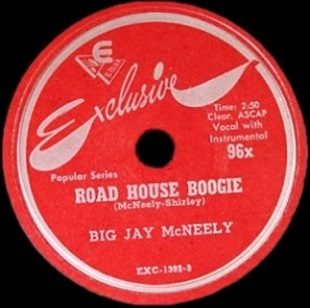 But the interesting thing is that Jordan’s record is fact a more fleshed out version of a Big Jay McNeely original rocker from early in 1949 called Road House Boogie. Do They Have Fish Fries In Roadhouses? Now there’s a lot to get into here so we’ll try and hit all of the pertinent facts as we know them and see where it leads us. Saturday Night Fish Fry was written by Ellis Walsh who was a drummer for Eddie Williams & His Brown Buddies whom we’ll be meeting next month as they make their debut with pianist/vocalist and rock stalwart Floyd Dixon. After another record issued in September led by Dixon, which incidentally gave them their first hit, they followed it up quickly in October by releasing their version of Saturday Night Fish Fry to take advantage of the fact that Jordan was already ascending to the top spot on the charts with his own version. Walsh himself gets the lead artist credit on theirs as he handles the vocals in an exaggerated humorous way, not even singing so much as spewing the lyrics in a stream-of-consciousness type manner over Dixon’s simple piano rhythm and Ellis’s basic drum beat. In their hands it was more novelty than a straight protest song but still completely recognizable for all those familiar with Jordan’s take on it, which by that point included virtually everybody in black America. So just how did Louis Jordan get his hands on it first? Well it’s not via the usual underhanded means you might suspect in cases like this. Right after Walsh laid down his demo of the song in the summer he himself brought it to Jordan in the hopes of getting him to record it, knowing that the lyrical approach and the topic itself were ideal for Jordan’s style. This also makes sense from a financial perspective. Williams’ crew hadn’t scored a hit yet and their commercial prospects were therefore uncertain and Walsh himself wasn’t much of a vocalist. By contrast Jordan was the biggest star in the business and a singer renown for his way with a song. Since Walsh would earn songwriter royalties no matter who did it there was an obvious benefit to having Jordan record it – and that he did. But as for where the whole concept of the song originated, particularly the far more musical structure of it that Jordan added which got him a co-writing credit, the answer is clear. It was with Big Jay McNeely. McNeely’s Road House Boogie is the TRUE source of Jordan’s immortal “Fish Fry”. Though Jordan’s lyrics are identical to the Walsh version the structure of Jordan’s delivery is clearly found with Ted Shirley, who was McNeely’s bass player and occasional vocalist. Now Shirley is hardly Caruso as a singer but he doesn’t have to be on Road House Boogie as the tone is somewhat conversational. Yet it’s still far more melodic than Walsh delivered. It’s certainly possible to listen to McNeely’s record and Walsh’s and not immediately connect them other than possessing a general similarity. The stories are close, but different enough not to draw a lawsuit and though the frameworks resemble each other, that aspect gets downplayed to a degree. So if Walsh himself got his idea from the McNeely record he wisely disguised it by altering his own delivery. But when it comes to Louis Jordan there can be absolutely no doubt that he’d heard Big Jay’s record and adapted it as closely as humanly possible. Everything about it – the cadence, the meter, the emphasis on humor while still keeping it within the melodic framework – is identical. Jordan does it BETTER, unquestionably, and he’s also got a better storyline, courtesy of Walsh (who definitely does deserve credit for that aspect), but the entire structure itself comes from McNeely’s record. The story is pretty close in all of the “versions”, the Walsh led “original” included. Ellis Walsh definitely contributed a lot to the final familiar song, coming up with some great lines and telling the story with a keen eye, but Shirley’s work on Road House Boogie is the same basic idea, although without the social protest aspect which probably defines “Fish Fry”. The rest though, from the set up at a wild party that had plenty of booze, girls and uninhibited grinding going on, right down to the arrival of the cops is the same. The primary difference is that here the law is brought in by a flashy hep-cat with “rings on his fingers” who found his wallet missing and he suspects another of the guests of swiping it. At risk of ruining the suspense the stolen loot was found in one of the girl’s “store bought hair“. Unlike “Fish Fry” where the gendarmes are a decidedly unwelcome presence who round up Jordan and crew and haul them off to prison for their crimes, which consists merely of having too much fun while black (which, let’s face it, always upsets white America to no end) and truthfully which is what makes “Fish Fry” so memorable thereby accounting for a large part of its deserved legend, here on Road House Boogie the men in blue are actually corrupted by McNeely’s saxophone and they wind up urging him to cut loose which sends the whole thing into a frenzy. But otherwise there’s not much difference to be found. The McNeely record even uses the same vocal hook that Jordan’s known for, that of Shirley crying out, “They were rockin”, leading into McNeely’s soloing which turns Road House Boogie into a much more rousing and celebratory affair than depicted in “Fish Fry”. Jordan however, maybe knowing he couldn’t hope to compete on the horn with Big Jay, or perhaps being a more astute judge of commercialism, shifted the FOCUS of his take on this ordeal to that specific line, using it as the chorus buttressed by a funky piano response each time it’s repeated. Certainly Saturday Night Fish Fry is the better record. It simply has more things going for it. A deeper story told over two engrossing parts that provided far more detail along with the strong undercurrent of injustice that the audience obviously knew all too well. Unlike the Walsh version which was a bare bones musical outline Jordan’s version also retained the catchiness of McNeely’s song and even without the explosiveness that Big Jay brought to the table it was still incredibly well played and something that’d stick in your head for a long time. Truth be told for the time it came out in, “Fish Fry” is pretty close to an epic. A widescreen presentation with arguably the best “actor” among singers that music has ever known giving perhaps his greatest performance. But Road House Boogie is pretty damn impressive in its own right and is the original source material to boot, even if the focal point on each is a little different. Nothing about McNeely’s record is exactly weaker than Jordan’s, just noticeably less ambitious. But that’s hardly a criticism at all. All of which brings us back to the larger picture – Jordan’s losing ground to rock ‘n’ roll and cannily adapting the aspects of it he knew he could make work, while sidestepping those attributes best left to young guns like McNeely. But that also leads to the question of why hasn’t the proper chronology of the three songs been sorted out prior to this? Everywhere you look the story of Saturday Night Fish Fry leaves Big Jay McNeely out of the equation entirely, even among those who dutifully remark on the rather obscure Ellis Walsh version (which got obliterated by Jordan’s in sales), as plenty of researchers have gotten the dates of those two right, even correctly reporting that while Jordan’s “Fish Fry” was RELEASED first Walsh cut his demo first and is the primary composer of the song. Yet neither one is the originator of it as anyone who listens to all three can tell. Sadly too few people seem to have bothered to listen, or at least listen and then look up the lineage. Even in Jim Dawson’s otherwise exemplary book about McNeely, Nervous Man Nervous, he states “Road House Boogie was a humorous number sung by gravelly voiced bass player Ted Shirley that was based on Louis Jordan’s 1949 hit ‘Saturday Night Fish Fry’”. No it wasn’t. Unless contradictory hard evidence is unearthed there can be no doubting that Walsh and Jordan copied McNeely, something we know because McNeely cut this in April, Walsh did his demo months later in the middle of summer (after Big Jay’s record was released) and then Jordan laid his down on August 9th. Those are the facts as we know them. Draw your own conclusions. In the end what matters is that Jordan got a tremendous capper for the decade he defined. That he got it with a song which drew heavily from rock is ironic considering rock is what would soon push him aside. In later years Louis Jordan didn’t seem all that bitter about his declining fortunes and he didn’t decry rock ‘n’ roll on musical grounds as so many others did once they faded from view. In his final interview before his February 1975 death he was discussing a show he did not long before that at the Apollo Theater, at the height of the 70’s rock era, in which he performed just one “rock” song in his brief set and was impressed that he’d still been able to connect with the young audience. That song was Saturday Night Fish Fry. Maybe by referring to it as such he was acknowledging something that should’ve been obvious to everyone decades earlier, namely it was a song taken directly from rock ‘n’ roll. As for the REAL rock version of the song, that of Road House Boogie, Big Jay McNeely showed why even if he never would rise to Jordan’s level of popularity and acclaim – who could after all? – the music that Big Jay was in the process of helping to define as it took over the world would in fact wind up being bigger than them all. So big in fact that even the biggest star of the previous era wasn’t averse to borrowing liberally from it to compete. With all Jordan had done to lay the groundwork for rock ‘n’ roll over the previous decade I suppose he was entitled to take a little back in return. That’s okay, unlike in the resolution of “Fish Fry” we won’t be locking him up for it. Leave a reply on "Big Jay McNeely: “Road House Boogie”"